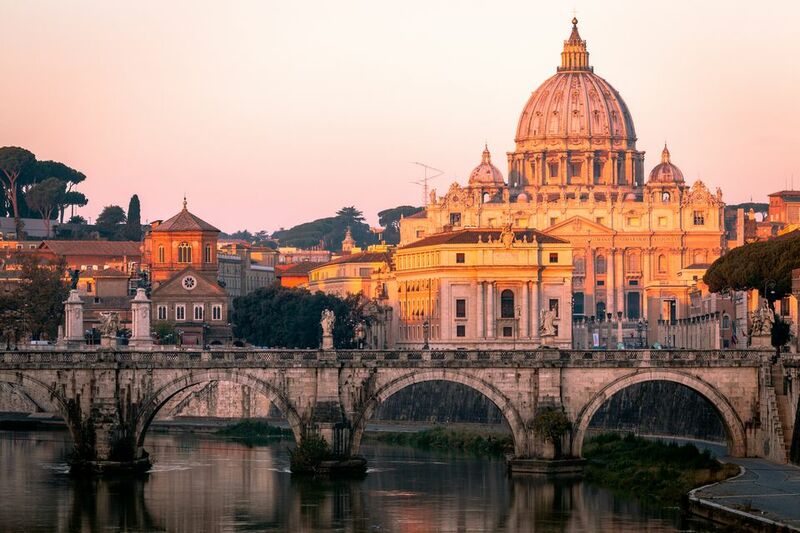 As the seat of the Catholic Church, Rome is the top Italian destination for Easter week, or Settimana Santa, primarily because of the events led by Pope Francis in Vatican City and elsewhere in Rome. If you want to visit Rome during Easter Week (also called Holy Week), be sure to book your hotel well ahead of time. If you want to attend a Papal Mass (more on that below), you will need to reserve your free tickets months in advance. If you want to attend the Vatican Palm Sunday mass, get there early and be prepared to stand for a long period of time. The Blessing of the Palms, Procession, and Holy Mass for Palm Sunday take place in the morning, usually starting at 9:30 a.m., in Saint Peter's Square. Although this event is free, the square is usually very crowded and it is hard to get admission. Visit the Papal Audience website for information on requesting tickets to see the Pope at Easter and at other times during the year. Holy Thursday Mass is held in the Saint Peter's Basilica, usually at 9:30 a.m. A Papal Mass is also said in the Basilica of Saint John Lateran, Rome's cathedral, usually at 5:30 p.m.
On Good Friday there is a Papal Mass at the Vatican in Saint Peter's Basilica at 5 p.m. As with other Papal masses, admission is free but tickets are required and can be requested from the Papal Audience website. In the evening, the ritual of the Way of the Cross, or Via Crucis, is enacted near Rome's Colosseum, usually starting at 9:15 p.m., during which time the Pope visits each of the 12 Stations of the Cross. The stations of the Via Crucis were placed at the Colosseum in 1744 by Pope Benedict XIV and the bronze cross in the Colosseum was erected in 2000, the Jubilee year. On Good Friday, a huge cross with burning torches lights the sky as the stations of the cross are described in several languages. In the end, the Pope gives a blessing. This is a very moving and popular procession. If you go, expect big crowds and be aware of the possibility of pick-pockets as you would in any very crowded tourist place. This event is free and unticketed. On Holy Saturday, the day prior to Easter Sunday, the Pope holds an Easter Vigil Mass inside Saint Peter's Basilica. It begins at 8:30 p.m. and lasts for several hours. As with other Papal Masses, free tickets are must be requested from the Papal Audience website. Although there are thousands of attendees within Saint Peter's (the basilica can seat 15,000), this is still one of the more intimate ways to experience a Papal Mass at Easter. Because you will go through security screening in order to enter the basilica, plan to eat a late lunch/early dinner and arrive several hours before the mass begins. Easter Sunday Holy Mass is held by Pope Francis in Saint Peter's Square, usually starting at 10:15 a.m. The square can hold up to 80,000 people, and it will be filled to capacity on Easter morning. The mass is free to attend, but tickets are required. They must be requested months in advance through the Papal Audience website. Even with tickets, your place on the square is not guaranteed, so you need to arrive early and expect to wait, standing, for several hours. At noon the Pope gives the Easter message and blessing, called Urbi et Orbi from the central loggia, or balcony, of Saint Peter's Basilica. Attendance here is free and unticketed — but only those who arrive early and wait will have a chance of getting close to the blessing. Pasquetta, the Monday following Easter Sunday, is also a holiday in Italy but much more jovial than the solemn Easter week events. It's common to have a picnic or barbeque, and many Romans head out of town into the countryside or to the seaside. At Castel Sant'Angelo in Vatican City, a huge fireworks display over the Tiber River ends the Easter week celebrations. Easter marks the end of Lent so food plays a big part in the celebrations. Traditional Easter foods include lamb, artichokes, and special Easter cakes Pannetone and Colomba (the latter is dove-shaped). Though many restaurants in Rome will close for Easter Sunday, you should be able to find places serving Easter lunch or dinner, most likely a multi-course, set menu. Arrive hungry and plan on staying a while! Since the Easter Bunny is not an Italian tradition, holiday treats for kids usually consist of large, hollow chocolate eggs, which sometimes contain a toy. You'll see them, along with Colomba, in many shop windows. If you want to try Easter cakes or other sweets, we recommend you buy them from a bakery rather than a grocery store or bar. Although they will probably cost more, they are usually much better than pre-packaged versions.